Dream Death is a thrash/doom/death metal band from United Sates of America (Pittsburgh, Pennsylvania), formed in 1984. First line up was: Brian Lawrence - vocals and guitar, Terry Weston - Guitar and Ted Williams - Bass. 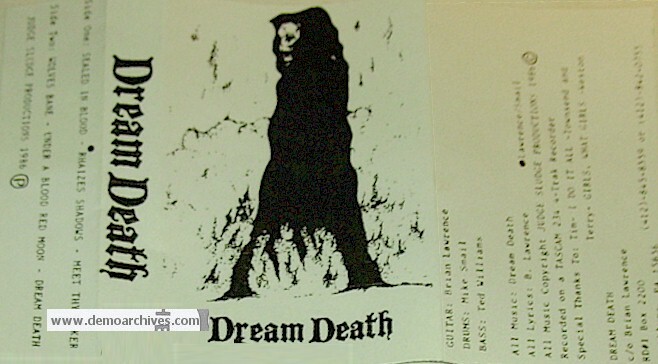 Two years after their formation (1986), under that same line up Dream Death released a self titled demo Dream Death, independently. The album can be given a tag of death/doom with some speed influence. Sound and even the cover art of the demo will remind anyone of early Slayer. Slow songs, bad quality and… bad quality vocals create a creepy, dark atmosphere. Even though all songs on this demo are good only Dream Death and Sealed In Blood appeared on Dream Death's first full-length. The same year, (some 2-3 months later after the release of demo Dream Death), the band released yet another demo More Graveyard Delving. Not much had changed. Three songs from this demo appeared on Dream Death's first full-length, those being Back From The Dead, The Elder Race" and Bitterness & Hatred. Before recording their first full length Dream Death was accompanied by Terry Weston, guitar player. With the new guitarist Dream Death's sound was more "juicer" and songs from demos sounded much better on the following album (good production can also be given some credit for that good sound). Dream Death released their first full-length Journey Into Mystery in fall 1987 through New Renaissance records.